I’ve written before on this blog about how I have worked contemporary issues around the theme of immigration into my art and culture lessons. Immigration as a social theme is one that has always been with us. But I hadn’t anticipated when I first started putting lesson material together just how big an issue it was about to become and how it was going to touch European social and political structures in so many ways. Apart from exposing the pupils to areas of new experience in the art and cultural world part of my teaching task is also to strengthen their grasp of English. I teach in English, the pupils’ second language, and deliver my content in a dual learning approach known as CLIL (content and language integrated learning). I am constantly looking for new ways to bind the arts material of the lesson to language learning opportunities without compromising the content. With this background in mind I will this year I’ll be adding a new element in the immigration module that offers some new language possibilities that I haven’t explored before. I should first though say thank you to Kathrine over in Kansas for pointing me in the right direction for this new source of material. 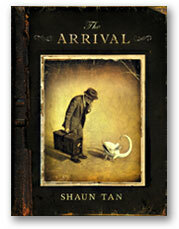 It concerns a book called The Arrival by the Australian artist, writer and filmmaker Shaun Tan. The Arrival is a graphic novel, it follows the story of a man who flees his homeland, leaves his family behind and arrives in a new and unfamiliar place. What makes Tan’s novel rather different is that the whole story is told without the use of text. We are not told specifically what he is running from, clever visual devices are used to clue us in to the fact that he is trying to escape something that hangs like a specter over society there. Each page on the A4 format book is made up of multiple drawings (often twelve or more on a page) each sensitively and realistically drawn. 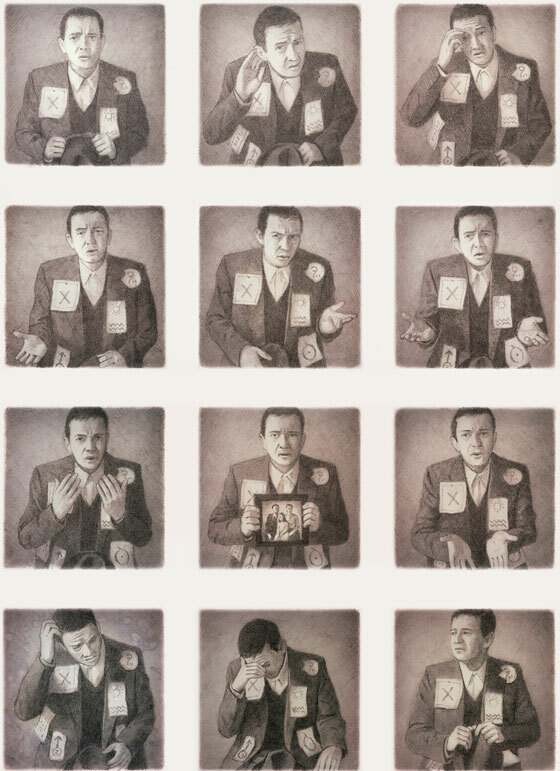 The book (like other graphic novels) could open the door to practical assignments linked to depicting stories using multiple images, but what of the language driven opportunities? The fact that each page carries so much information and communicates so much content is where the CLIL learning opportunity lies. Tan’s approach tells a story that on many pages that can be laid down next to the current events that we are seeing across Europe, we bring our own baggage and opinions and add them to the story being played out in The Arrival. I find myself thinking of several possibilities here, not necessarily working with the whole book, loose pages may well be enough. These are obviously all language driven assignments, useful in challenging pupils articulation of complex themes. But for me as an art teacher interested in showing the importance of the arts in engaging in contemporary and relevant issues the chance of encouraging to place themselves in the position of the main protagonist in the book and in doing so maybe gain a little more understanding of the refugee situation confronting Europe is where the real gain lies. An amazing article with excellent ideas, thank you, Peter! The idea of teaching global issues through art looks really interesting, using the visual code to elicit creativity and critical thinking seems challenging and motivating for learners. Thanks for sharing through the facebook CLIl group. Thanks for the compliment Pietro, I’ll be using this lesson material in a week or two again….and will continue to share things through the CLIL Facebook group.